FOX NEWS is guilty of eavesdropping by airing the hot-mic comments. What they did was illegal and immoral. Now, they get paid by Rupert Murdoch. you are right; what Fox News did with their mic is wrong. But I don’t really care about what Jackson said about Obama other than him calling back people N-word. 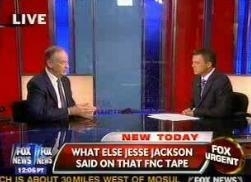 No doubt, folks at Fox News could be very sleazy sometimes. The name “FOX” speaks for itself.. can’t be trusted. I think Bill O’Reilly tried to play his own part nice so that more Democrat bigshots could still come on his show. As for Rupert Murdoch, I don’t what the “old-dog” is still looking for in American politics. His time has passed. He should hand over his media empire to his sons, and go back home, retire somewhere in the Pacific.